Been to the movies lately? Then maybe, like me, you’ve seen the trailer for Loving, a soon-to-be-released film about Mildred and Richard Loving, the Virginia couple jailed for their interracial marriage in 1958. The preview shows several disturbing scenes and menacing encounters, including a chilling middle-of-the-night arrest. 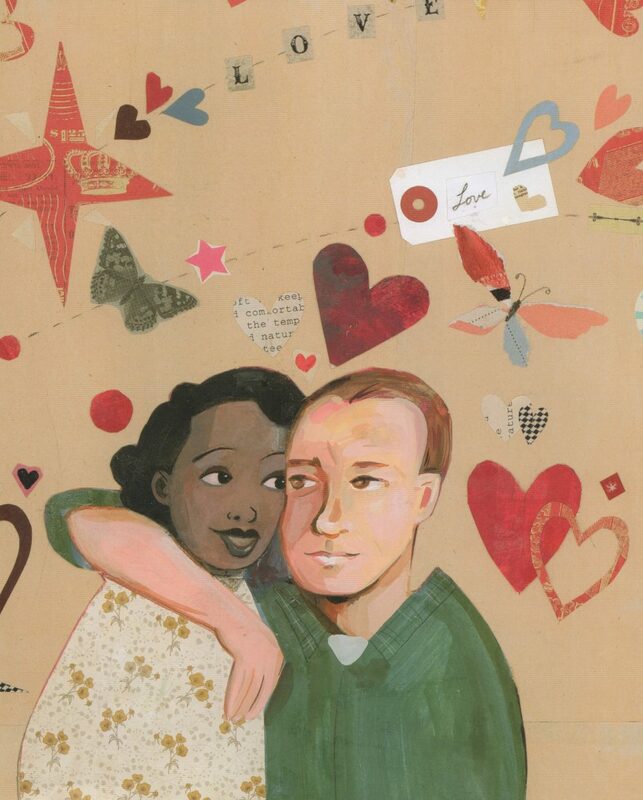 Watching the trailer prompted me to re-read The Case for Loving (Arthur Levine Books, 2015)—written by Selina Alko and illustrated by Selina and her husband, Sean Qualls—a picture book about the same couple. Given how tense I felt watching the trailer, I wondered how Selina and Sean managed to tell this story in a way that’s appropriate for a young audience—so that it engages a child’s interest, but isn’t overly frightening and doesn’t get bogged down in the long legal battle. Not surprisingly, the book touches only lightly on the legal issues. And while it doesn’t completely omit the frightening moments—there’s a spread devoted to that middle-of-the-night arrest—it doesn’t dwell on them either. 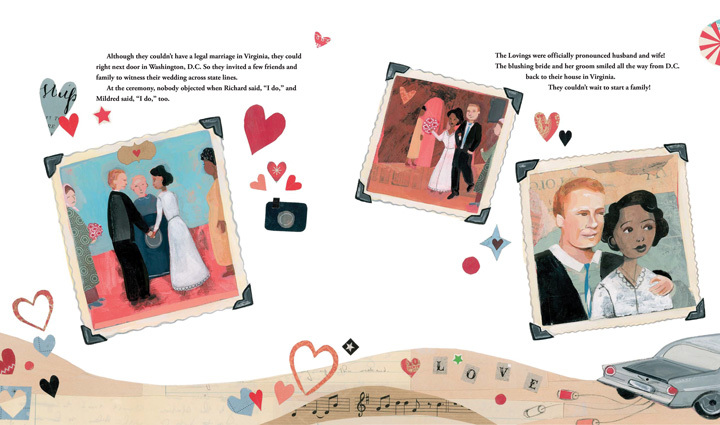 The Lovings could have moved to another state where interracial marriage was legal—and they did, in fact, relocate for a time. But they wanted to be in Virginia, near their families, where they had roots. And so they fought, all the way to the Supreme Court, for the right to have their marriage recognized in their home state. Because they loved each other, and it was only fair. Kids get that. It’s been nearly 50 years since the Supreme Court ruled state bans on interracial marriage unconstitutional (Loving v. Virginia, 1967). Still, the Loving’s story remains relevant to current issues of race relations and marriage equality. The personal Author’s Note (the book’s creators are themselves an interracial couple) and resources listed at the back offer more opportunities to dig in and discuss these issues in greater depth. For more good stuff, there’s a great interview with Selina and Sean here. P.S. The winner of the Hey, Coach! Giveaway is Susie Sawyer. 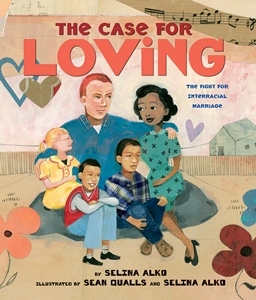 Linda Ashman, nonfiction, Sean Qualls, Selina Alko, The Case for Loving. Bookmark. It is a lovely book indeed, Linda! I also love how it’s both a personal and professional collaboration of two artists at work. Yes, it’s so interesting to read about how they work together! Yes, it really is, Kathryn. You’re welcome, Kris. Thanks for reading! Thank you, Linda. This is a book I will definitely put on “hold” at my local library. It’s really well done, Anne. I think you’ll like it. Wow, I didn’t realize that it was illegal to intermarry in the 60’s. I went to a very integrated high school in the 60’s. Classmates were biracial. It seemed normal to me. I want to read the book and see the movie. I look forward to reading this book. Yes, Cassie, it’s really hard to believe such laws were in place, and not very long ago! I’m looking forward to seeing the movie as well. Love the book! Can’t wait to see the movie! Thanks for sharing this book, Linda. I look forward to learning more about this couple’s story. It’s a really beautiful book, Rachel. I think you’ll like it. Thank you for bringing this book to my attention. I knew it existed, but had never read it. And I can’t imagine giving the book a better title than THE CASE FOR LOVING. Yes, it’s so appropriate, isn’t it? Thanks, Kathy! Hey, Jennifer! You’re always welcome to lurk, of course, but it’s great to hear from you! I’m glad you reserved the book–it’s a beauty. 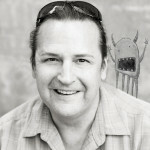 And that’s great that you’re critique partners with Susie–the book is on its way! Thank you for this post, Linda! 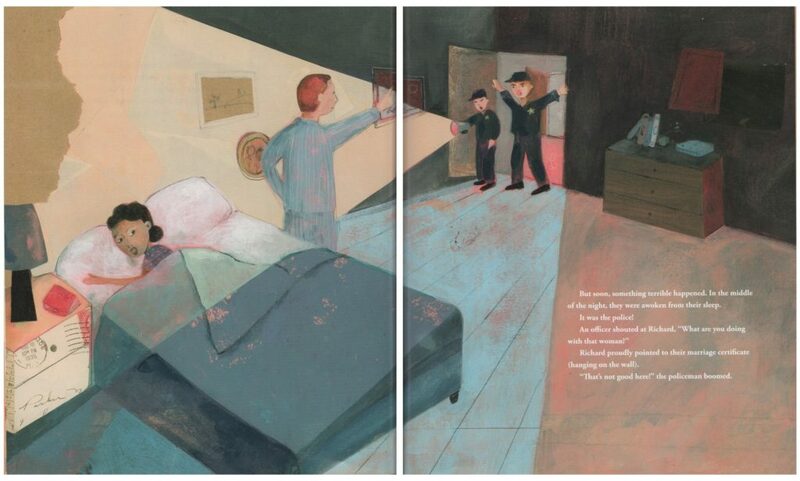 What a big topic to take on in a picture book! Can’t wait to see it!